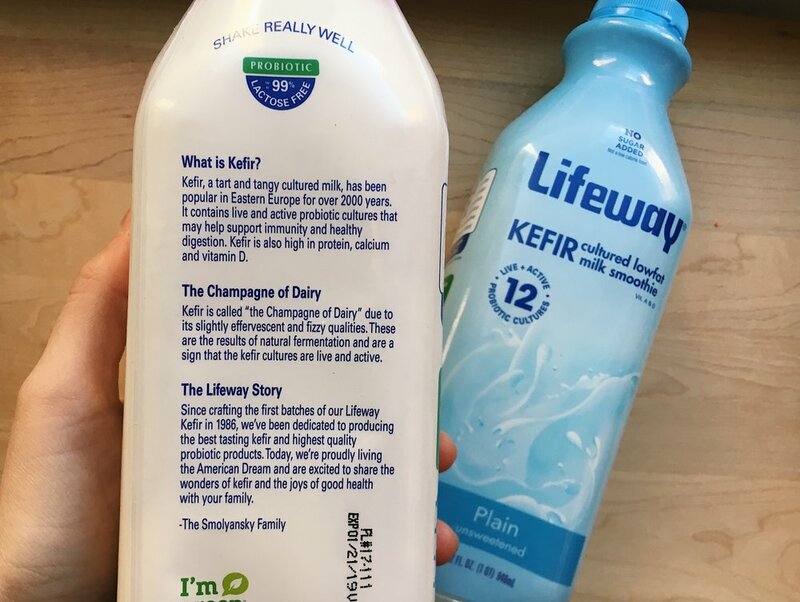 This post is sponsored by Lifeway Kefir. Kefir is a nutrition powerhouse, which I've discussed in my previous post, and it's also much more versatile than you might think. 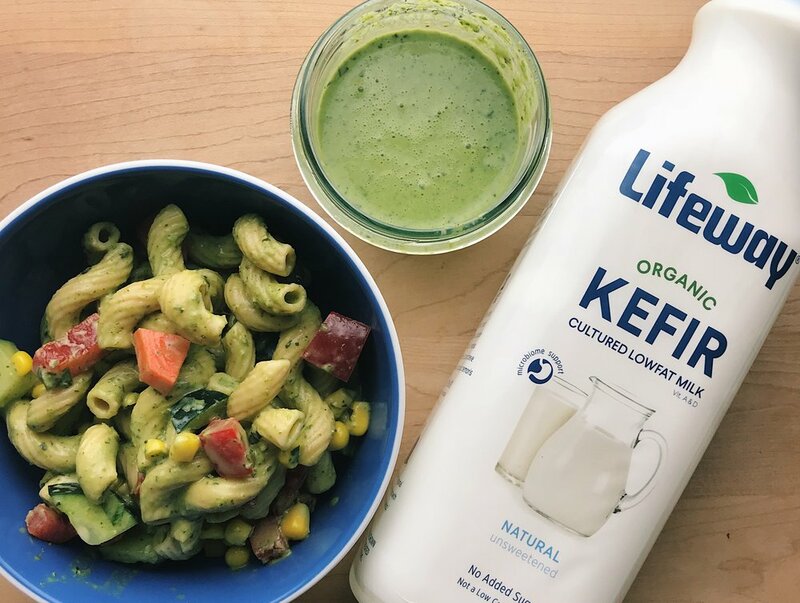 Check out these ways below to incorporate Lifeway Kefir at every meal of the day. Why: Kefir adds protein to smoothies without the protein powder flavor. You can also add several pre-biotic ingredients such as fruits, vegetables, nuts/seeds to help feed the probiotics. Kefir can also be used to add protein to oatmeal or overnight oats. Oatmeal is a breakfast staple in the United States, but people often find that it lacks the staying power that other breakfasts have. This is likely in part to its low protein content. Adding kefir to your cooked oats adds protein as well as a nice creamy consistency. Why: Stirring kefir into hot soup helps create a creamier consistency without flour or heavy cream. It can also cool down a soup that’s too hot to eat and bring it to a ready-to-eat temperature. Also works great in cold summer soups. Try it in tomato basil soup or this cold cucumber soup. Follow the linked recipe but replace yogurt with kefir- it adds more protein compared to regular low-fat yogurt and a lot more probiotics. You will need less water (maybe not any at all) since kefir is a thinner consistency than yogurt. Why: Kefir adds an amazing creaminess to salad dressings and acts as a great replacement in mayonnaise-based dressings. It also packs more nutritional punch than mayonnaise because not only does it provide healthy fats, but it also adds protein to help keep you full and probiotics to support a healthy digestion. Check out these recipes below for examples. Crema is a Mexican cheese with the consistency of a thick cream, but a slightly sweeter taste. This recipe is a twist on the traditional crema, using Lifeway kefir as a base. 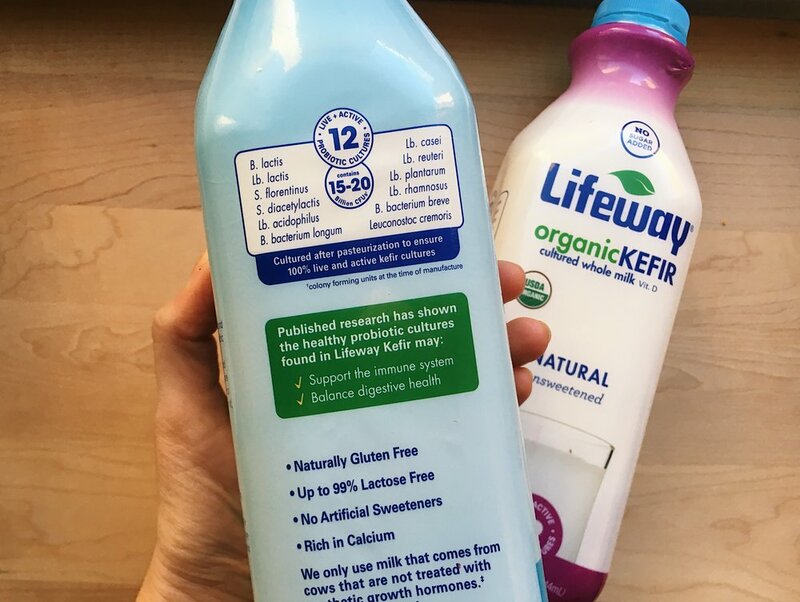 Lifeway kefir contains 12 strains of probiotics, and this variability has been shown to be beneficial for gut health. This recipe also includes prebiotics from the beans, sweet potatoes, onions and other vegetables. Prebiotics feed the gut bacteria, and these components work best when consumed together. 1. If you are opting for the bowl option, then start by cooking the rice. a. Add rice to a large saucepan with 2 ¼ cup water. Bring to a boil, then turn down to simmer and cook for about 30 minutes until water has absorbed. b. If you are opting for tacos, then skip to step 2. 2. Heat oven 400F. Cut sweet potatoes in 1 inch chunks (pieces can be uneven). Toss with 1 tablespoon of avocado oil, plus the chili powder, paprika, and black pepper. Roast for 30 minutes, tossing halfway through. 3. Drain and rinse black beans. Set aside. 4. Chop mushrooms and zucchini. Heat other tablespoon of avocado oil over medium-high heat in a large frying pan. Add mushrooms and zucchini. Cook until soft, about 8 minutes, stirring frequently. 5. Blend all ingredients for avocado crema together until smooth. a. 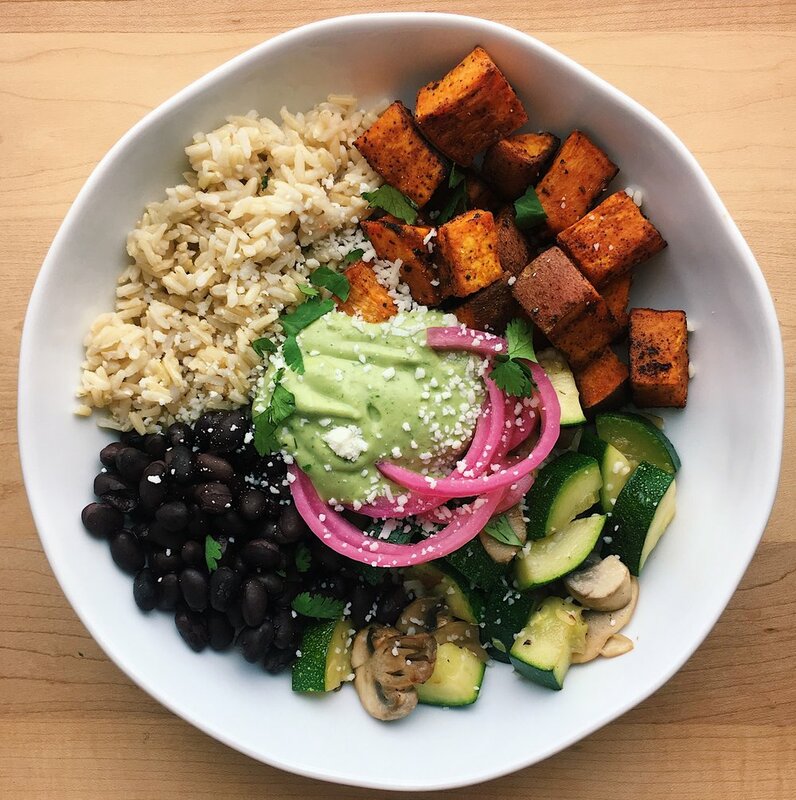 If making bowls: Arrange rice, sweet potatoes, cooked vegetables, and black beans around the bottle of the bowl. Top with crema, cheese, and pickled onions. b. If making tacos: Lay your tortillas flat, and spread each with crema. Add sweet potatoes, cooked vegetables, and black beans. Top with crema, cheese, and pickled onions. Bowls are great for meal prep. You can also cook a half batch of rice to have tacos for dinner, and then leftovers bowls for lunch the next day. Tacos tend not to travel/store well. I've been a fan of spicy food for a while now, maybe ever since I learned of the magic that is buffalo chicken- I know my college friends can attest to that. While I can still appreciate that flavor in my food, my palate has expanded a bit since then and I’ve started to explore other ways to add heat to my meals. I recently partnered with Yellowbird Sauce, a company based out of Austin who that makes amazingly flavorful hot sauces of fresh ingredients. You don't see anything vague in the ingredients list like "natural flavors" and you can pronounce everything on the label. They taste amazing, plus they come in regular size and cute little travel sizes in case you're the kind of person who needs hot sauce with you at all time (at work, traveling, etc). They have 5 flavors- jalapeno, habanero, serrano, blue agave sriracha, and ghost pepper. I’ve tasted 4 of the 5, except the ghost pepper because I gotta admist I'm a little nervous I can't handle that kind of heat. If you haven't heard of a ghost pepper before, read about it here... yikes. This recipe uses Yellowbird's blue agave sriracha, which I chose because the blue agave adds a nice sweetness which balances out some of the tangy flavors in the recipe. 2. Cut tofu brick in half so that you have two thin bricks equal in size. Place each piece on a folded paper towel on a plate and press to get as much liquid out as you can. Repeat this a few times until the tofu feels more dry. This is the key to getting crispy tofu. 3. Spray a baking sheet with oil. Evenly spread out the tofu and bake for 30 minutes, turning halfway through. 4. Combine rice in a large saucepan with 2 cups of water, sesame oil, and a pinch of salt. Bring to a boil, then turn down to simmer. Cook for 25-30 minutes until water has absorbed. 5. Cut broccoli and carrots into bite sized pieces. Toss with a little olive oil, then bake on a separate baking sheet for 15-20 minutes. 6. Slice cabbage into very thin slices. You can also use a mandolin or shred in a food processor if you wish. 7. Add all sauce ingredients to a small blender and mix well. I ended up adding about 3 tablespoons of water, but you can adjust accordingly. 8. Add riced cauliflower to the pot with the brown rice and mix well. 9. When the tofu is done cooking, add it to a mixing bowl with half of the sauce and toss well to coat. 10. Assemble bowls (or tupperware) with cabbage, rice mixture, broccoli, carrots, and tofu. Top with the remainder of the sauce, and sesame seeds. Add a little more Yellowbird Blue Agave Sriracha hot sauce if you like things spicy. This recipe is great for meal prep as it can easily be divided into tupperware. Find there products in a store near you here. As discussed in my last post, my full-time job is working with patients with chronic kidney disease (CKD). There is a large body of emerging research supporting the benefits of a plant-based diet for people with CKD. This diet would include nuts, seeds, beans, legumes, whole grains, and many other foods traditionally discouraged in this population. One of the many reasons why a plant-based diet may be beneficial is that humans do not absorb the phosphorus in plant foods as readily as they do animal foods. This is because much of the phosphorus in plants, such as nuts and beans, is bound to phytates which humans do not absorb. To someone who has had CKD for a long time, recommending a plant-based diet might seem a little crazy since it goes against what they have been taught in the past, but the research to support this diet is strong. Almost everyone that I talk to with CKD tells me that they are trying to limit nuts and beans, if not avoiding them altogether. Because of the newer research about plant-based diets, and the numerous health benefits of plant protein such as nuts and beans, I try to help patients focus on getting appropriate (but not excessive) portions of these foods. This recipe uses chickpeas, which are lower in potassium and phosphorus than most other beans. It also limits portion to a half cup serving. While traditional pesto uses pine nuts, this recipe uses walnuts, which contain about 2/3rds the potassium and phosphorus per ounce as almonds and many other popular nuts. A low sodium diet is important for people with CKD to normalize blood pressure and prevent excess weight gain from fluid. It’s important to use a variety of seasonings in order to flavor foods when salt is being limited. Olive oil and lemon juice are both great options. Added salt in this recipe is limited to 1/8 teaspoon per serving (less than 300 mg sodium), which easily fits into a low salt diet with about 2000 mg sodium per day. The recipe I created below using FLAVIS fusilli pasta complies with low sodium, low potassium, low phosphorus, protein controlled diet guidelines, while being 100% plant based. 1. Add all of your pesto ingredients to a small blender/food processor and blend until smooth. Add a little water to thin, probably about 2-4 tablespoons. 2. Cook FLAVIS fusilli pasta according to package directions. 3. While the pasta is cooking, steam your broccoli. Add to a microwave safe bowl with about 1 tablespoon of water and microwave for 3 minutes until cooked. 4. Drain pasta. Add back into the pot and mix in the pesto, broccoli, and chickpeas. Enjoy! Heat olive oil in a large skillet over medium high. Add zucchini, red pepper, mushrooms and onion; sauté until tender. Add garlic, thyme, and pepper, then sauté 1 minute longer. In a bowl, whisk eggs, milk, nutmeg, and black pepper. Add half of the parmesan cheese and half of the goat cheese. Coat a 13x9-inch baking dish with cooking spray. Layer half the bread cubes, vegetables, and the rest of the parmesan cheese. Add another layer of bread cubes and vegetables. Then pour milk mixture over the top. Top with the rest of the goat cheese. Cover with foil and bake for 35 minutes Uncover and bake for 10-15 minutes more, until strata is brown at the edges and set in the center. Cooking and Servings Tips: To harden bread, cut into cubes and let sit uncovered for at least 2 days to get stale. Alternatively, you can cube and bake at low heat around 250F for 20-30 minutes. As mentioned above, it is important for people with CKD to limit their potassium intake. Potassium is found in many foods, but especially fruits, vegetables, beans, whole grains, nuts and seeds. Limiting these foods makes it difficult to meet dietary fiber recommendations. Interestingly, fiber intake is also important in regulating serum potassium levels because people with CKD become more efficient at excreting potassium in their stool. So how are people supposed to get enough fiber without getting too much potassium? FLAVIS brown bread provides 3 grams of fiber per slice, while also providing negligent levels of potassium and phosphorus. The recipe also provides a half cup vegetables per serving. Lower potassium vegetables were chosen in order to meet dietary guidelines. In addition to the previously mentioned plant sources of potassium, dairy also contains significant amounts of both potassium and phosphorus. This recipe uses almond milk, which has about half the potassium and phosphorus of dairy milk. Rice milk is actually the lowest potassium/phos option, but lacks the creaminess needed for this dish. Although this recipe does contain two different types of cheese, the lower potassium/phos options were chosen in order to add flavor without exceeding nutrient guidelines. Almond milk is also lower in protein than cow's milk, keeping the total protein of this recipe at 20 grams. April is earth month, so you’ve probably seen various posts and announcements about ways to reduce your carbon footprint. Some of these changes are as small as printing double sided or turning off lights when you leave the room. Other changes are grander, such as converting your home to solar power or buying an electric car. But one of the most effective environmentally friendly changes that people can make actually starts with daily habits surrounding food choice. Two of the major causes of our planet’s deterioration are pollution from plastic waste, and greenhouse gases from the farming of livestock. These are two issues that can be tackled by every person every single day by making more thoughtful food choices. In addition to the effect our dietary habits can have, we can also aim to be more efficient with our use of food by aiming to decrease food waste as well as plastic associated with food packaging. Below are 12 simple changes that you can make, most of which would take minimal time out of your day. Use your leftover herbs to make sauce.For whatever reason, fresh herbs seem to only be sold in quantities suitable for a small army. Instead of breaking off a few sprigs and letting the rest get moldy in your produce drawer, use the extra to make a sauce or puree. These will typically keep for longer than the fresh herbs, or can be frozen for later use. Two of my favorites are a green tahini or a pesto. Use what you have. Be flexible with your recipes. Vegetables can be easily swapped based on what you already have available. A recipe might call for kale, but if you already have spinach in your produce drawer then that can easily be substituted. Other good examples include asparagus instead of green beans, broccoli instead of brussels sprouts, or diced red pepper instead of carrots. Freeze food that’s about to go bad. Fruit is the perfect example of this. Fruits and vegetables are among the most commonly wasted foods in the US, likely in part to their short expiration dates. If you have fruit that’s about to go bad, peel it and throw it in the freezer. It can be thawed later to make smoothies, mixed into yogurt or oatmeal, or into a healthy jam. Plan before you cook. Knowing roughly how many servings you’re making will help you to know how much rice, pasta, or meat to cook. Rice and pasta expand hugely when they’re cooked, so people often over-estimate how much they need to pour out when it’s dry. Planning ahead will help to avoid a Tupperware of food that sits in your fridge uneaten until it goes bad. Do inventory before you shop. How many times have you picked up spinach at the store, only to see that you already have half a bag in the refrigerator? Unless you’re Popeye, you’re probably not going to eat all of that before it gets soggy. So you can either a) see steps 3-4, or b) do a quick inventory of your refrigerator and pantry before you head to the store. This will save you money by not buying the same thing, and will reduce food waste. Plastic is problematic because it breaks down and disintegrates into the water. This harms wildlife and our clean water supply. Read more here, here, and here. Share a trash can at work. Most of us who work in an office have our own individual trash can at our desks. We probably use it every day, but it rarely gets full to the top, and often will just have a few dirty napkins or an empty yogurt cup. But the employees who clean the office have likely been asked to empty these trash cans every night, which is a huge waste of plastic bags. Try having a communal trashcan for you and your surrounding coworkers in order to reduce the use of trash bags. Using one bag between four coworkers instead of one each will slash your area's plastic bag use by 75%. Stasher bags. These things are amazing. They’re made of silicone and much sturdier than a flimsy sandwich bag. They come in multiple sizes and can be refrigerated, microwaved, and put in the dishwasher. Perfect for storing food in the fridge, pantry, or transporting food and snacks to and from work. Not sponsored, I'm just obsessed. Shop here. Alternatively, you can try the brand LunchSkins. Reusable grocery bags. Bringing these bags with you to the store will save anywhere from 1-10 plastic bags depending on how big of a trip you’re making. Not to mention they’re much more durable and can typically hold more in one bag. If you already bring a purse/briefcase to work every day, it can be helpful to throw a bag or two in there for those last minute after work errands. Say no to bags in general. Many stores will automatically bag your items, even when they really don’t need to be. Think of when you buy a salad that you’re about to eat and they bag it, or when you buy a greeting card from CVS and they throw it in a bag. Get in the habit of saying “no thank you” in these situations to minimize unnecessary plastic bag use. Opt for real silverware. When given the choice, choose metal silverware in social situations, cafeterias, or in the break room at work. If real silverware is not available, you can always bring your own to work if you have a place to put it after (back in your lunchbox, wash and keep in your desk, etc). BYOB (watter bottle or cup): While this tip isn’t exactly a novel idea, it’s still important to remember to bring your own water bottle to work, on road trips, to the airport, and to the gym. 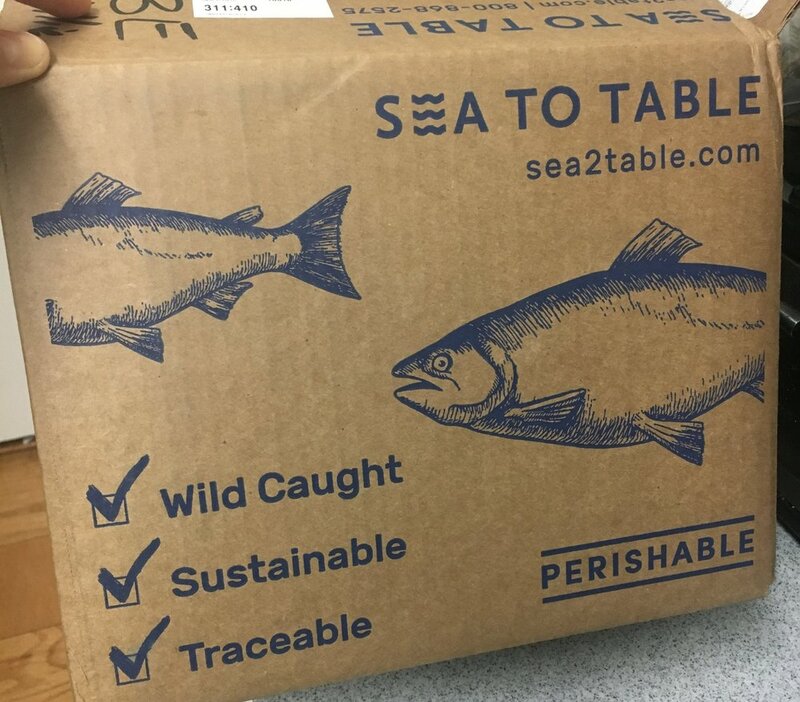 Sea to Table is a company that sources sustainable, wild-caught seafood from fisherman around the country. Much of the fish in your local grocery store is likely farmed. Although farmed fish does still share some of the same health benefits of wild-caught fish, it also has its downsides. Farmed fish typically contains antibiotics, hormones, and/or GMOs. In addition, farmed fish can often have more fat (and not always the good kind of fat!) than its wild counterparts. Read more about that here. Even when you’re able to find farmed fish at the grocery store, it can be difficult to know exactly where the fish came from. Sea to Table operates via full transparency, and you can also be happy to know you’re supporting American fishing communities. The fish arrives frozen and portioned. You can thaw and eat that night, or keep it in the freezer until you’re ready to prepare it. I chose the starter pack, which included salmon, shrimp, and cod. I did receive the product for free in exchange for my honest review, however these opinions are totally my own. Seafood arrives pre-portioned and packed with dry ice. Salmon is a regular in my rotation, but I’d never had this particular variety before. The quality looked better than I was used to just from taking it out of the package. 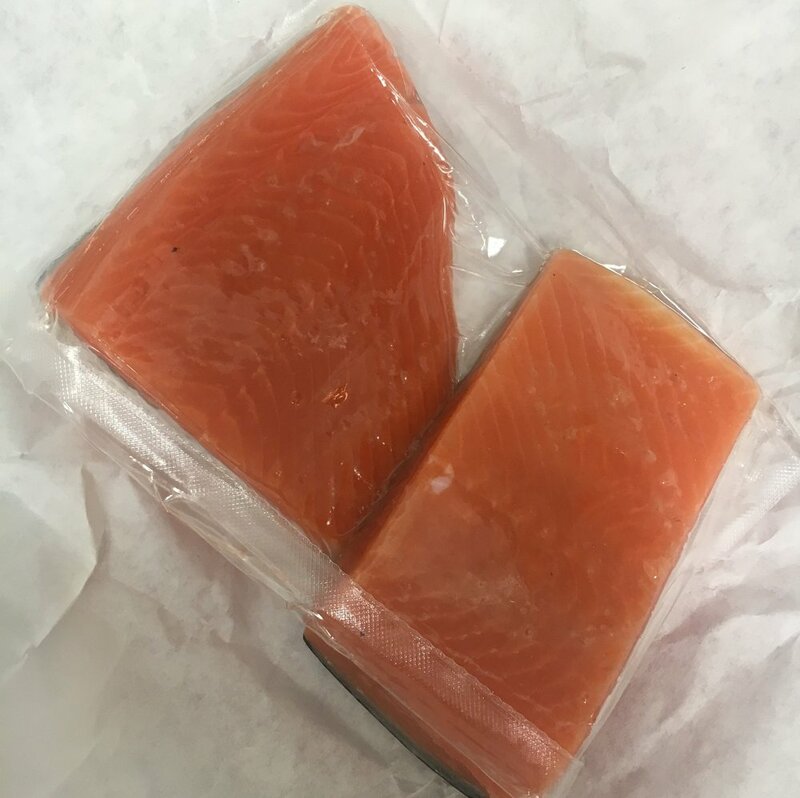 The color was lighter than the popular sockeye salmon, which makes sense because it does have a more mild flavor. Salmon’s most well known health benefit is its omega 3 fatty acid content. While everyone needs a mix of several different types of fats in their diets, those with a high proportion of omega 3 fatty acids have been shown to have several benefits. Omega 3’s are anti-inflammatory. In addition, they can also help raise HDL (your good cholesterol) without raising your LDL (bad cholesterol). I paired the salmon with a vegetable red curry and roasted sweet potatoes. It was based off of this recipe, which does happen to be Whole30, but that wasn’t actually intentional! Read this fellow RD's thoughts, which I happen to agree with, on Whole30 here. The flavors went well together and the salmon flavor was not overpowering since coho salmon is a more mild fish. 6 oz portions of Alaskan coho salmon, thawed in the refrigerator overnight. Salmon paired with roasted sweet potatoes and vegetable red curry. Mine in the front (4 oz salmon) and my boyfriend's in the back (8 oz salmon). Shrimp is another fairly regular protein in my dinner rotation. It’s also a great gateway fish for those who are unsure that they even like seafood. Shrimp does have a fairly healthy reputation, but has also become known for its high cholesterol content. Despite its high dietary cholesterol content, shrimp is very low in saturated fat, which has been shown to have a greater impact on blood cholesterol levels. This means that overall, it is still a heart healthy choice. It’s also a rich protein source, providing about 26 grams protein per 4 oz portion (which is the portion shown in this photo). Something else to consider, and yes this sounded kind of hilarious to me at first too, is that shrimp fraud is actually very common! What is shrimp fraud, you ask? It essentially means that the shrimp product you're buying is not actually what the label says it is. This study showed that up to 30% of shrimp products sold are misrepresented. Examples could include purchasing shrimp labeled "wild" when it's actually farmed. Sea to Table takes the guesswork out of that, which is something that's important to me. Now let’s get to the good part- the food! This recipe is so easy and I’d highly recommend it to even a beginner cooker. I marinated my shrimp in stasher bags and let them sit for 12 hours in the fridge, but the recipe says you can marinate for as little as 15 minutes if you’re in a hurry. Paired the shrimp with steamed broccoli and brown rice for an easy, balanced meal. Cod is a very lean fish, which means its low in total fat and high in protein. It’s flaky, delicate, and very versatile for cooking. The flavor is pretty mild, so it may be a good choice for people trying to avoid an overly “fishy” flavor. Sea to Table offers Pacific cod, which from what I’ve read is a better option right now because the east coast cod is somewhat over-fished, but the west coast populations are abundant. Because I was the least familiar with cod, I wanted to find a recipe with minimal ingredients so that I could get a sense of the true flavor of the fish. The cod was seasoned only with olive oil, salt, and pepper. Full disclosure, this was my least favorite of the three BUT it may have been my fault because I dropped the ball and forgot to defrost it beforehand. Sea to Table recommends defrosting in the fridge (not the microwave), but since I had forgotten to take it out of the freezer, I had to put it in the microwave which dried it out a little. Flavor was still great, just a little dry. The recipe included a simple white wine sauce and blistered cherry tomatoes, which helped moisten things up a little. I paired it with sautéed spinach and Trader Joe’s 10 minute farro for a super simple weeknight dinner. Packed fish comes with information so that you can trace the origins of your fish. All in all, I would highly recommend Sea to Table. The quality is fantastic and they do all the research for you so that you know you're getting a healthy and sustainable product. And the whole delivery thing doesn't hurt either! Check them out here. These are pickled lupini beans, which is something I’d never heard of until I saw these snacks on the shelves of a CIBO Express Gourmet Market at LaGuardia. They basically look like giant lima beans, with a slightly tangy and salty flavor from the pickling. The nutrition profile is spot on: 25 reasonably sized beans have 60 calories, 7g protein, 7g carbs, and 6g fiber. Talk about perfection. My favorite flavor is garlic and herb, but they’re all worth a try. If my love for chickpeas isn’t obvious enough from my food photos, then it certainly is now. 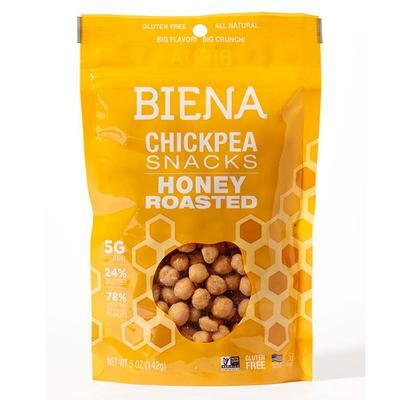 These are a great snack because they have the crunch of a chip or cracker, but provide more protein and fiber. There’s salt (100-260 mg per serving), but not so much that they’ll leave you feeling fluid overloaded later. My favorite flavor is sea salt (am I boring? ), but there are several others to choose from. One ¼ cup serving provides 130 calories, 6g protein, and 6g fiber. Last but not least, these babies are great for traveling or keeping at your desk because they don’t need to be refrigerated. This snack is a classic. Movie theatre popcorn gave it a bad name because of the gobs of salt and butter, but there are lots of great brands out there. Look for those with less than 65 calories per cup. Bonus points if it’s made with ingredients you can pronounce, like spices and real cheese (none of the fake stuff!). Popcorn has a good amount of fiber, usually about 5g per serving, which helps keep you full. Because it’s light and fluffy, a serving size of popcorn tends to be larger than many other foods, which may make it more difficult to overeat. 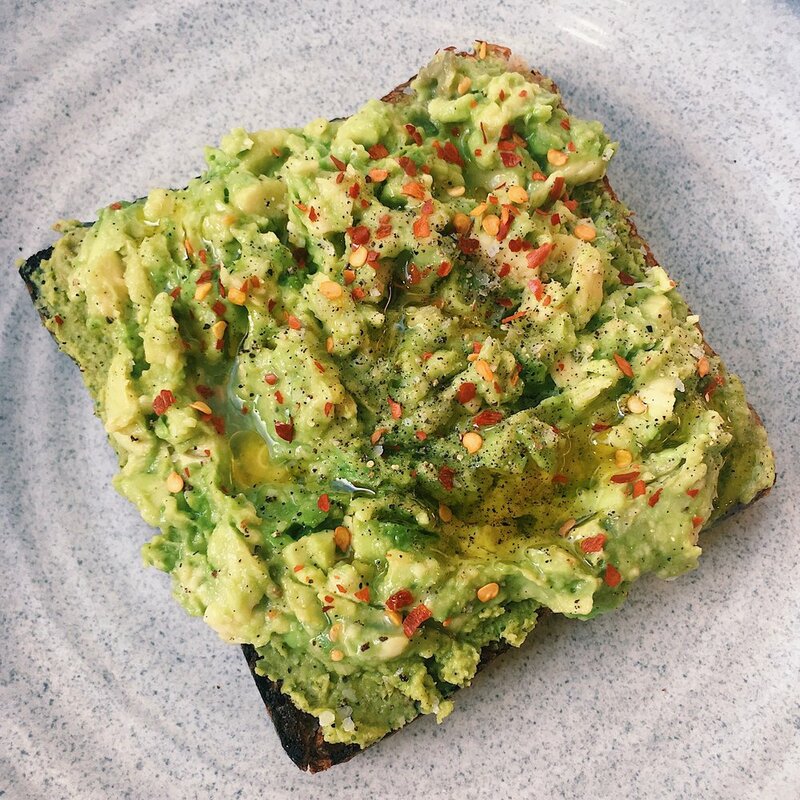 I don’t mean your grandma’s plain old boring toast. Load it up with nut butter, vegan cream cheese (hi Kite Hill chive), hummus, or mashed avocado to keep things interesting. Make sure to choose a whole grain bread. Some of my favorites include Trader Joe’s soft multigrain rustic bread or Food 4 Life Baking Ezekiel bread. My love for Siggi’s runs deep, but I’m actually not totally brand loyal. Chobani, Dannon, Icelandic Provisions, and several other brands make great high protein yogurt. These have a great protein:carb ratio to help keep you satisfied. If you don’t feel like a yogurt would fill you up alone, try adding a half cup of fresh fruit. This will only add about 40 calories but will up the fiber content and add some sweetness. Another great (and pre-mixed!) option is Muunacottage cheese. I just discovered these a few weeks ago thanks to a fellow RD pal and I’m really into them. As much as I love chips, I find they’re easy to overeat. The serving size is often deceptively small, and if I don’t eat slowly then I tend to go overboard. That’s why I find it helpful to dip both vegetables (low calorie + fiber) and one serving of chips/crackers (carby salty goodness) into a few tablespoons of hummus. Whole grain chips or crackers are your best options because they have more protein, fiber, and micronutrients. These combined with fresh vegetables and creamy hummus make for a satisfying snack. I was a little dismayed when I saw the nutrition information—800 calories per serving seemed crazy! I mentally went through ways to dietitian-ize it, such as using less oil when cooking and swapping the heavy cream for unsweetened soy milk, but ultimately I decided to just stick with the recipe. I’m actually glad I did, because the cream made a big taste difference (in a good way). The nutrition information also didn’t seem quite so bad when I saw the portion sizes. To me, this meal could comfortably fill 3 people. Everyone is different though, so others may feel it could feed 4 while some may agree with the 2 servings per package. Taste-wise, I really enjoyed this dish and was glad for the opportunity to cook with some spices and ingredients I don’t generally use. My primary criticism is that I would have liked for there to be more vegetables. We had some leftovers so I put them in a Tupperware and added some shredded carrots to get an extra serving of veggies in, which was really tasty! Overall consensus—would definitely make this recipe again, but would add some shredded carrots and diced tomatoes when cooking, and would divide into 3-4 servings. First impression before even making them was, “wow, these things aren’t the healthiest”. But then I remembered that we didn’t pick this one because of the nutrition—we picked it because we loved the pork buns we had last month at a Thai restaurant in the village and thought it would be fun to recreate them at home! That being said, I still went through a mental checklist of what vegetables we had in the fridge and tried to think of ways to incorporate them. Knowing that we had red cabbage and carrots, I googled “Asian cabbage carrot slaw” and tons of results came up. I was happy to know we’d have some low-cal veggies on the side of this indulgent dish. The buns themselves were delicious and fluffy, which is exactly what we wanted. The sweet potato tempura was a little difficult to execute so might not be great for a beginner chef. Overall consensus—some things should be left to the professionals. The buns tasted good, but they weren’t nearly as good as the ones we had from a restaurant. This was definitely my favorite meal of the three, but I may be a little biased with my love for fish. I had never heard of this fish before and was a little disappointed when I looked into it more to learn that it was farmed. This meal gets major points for the difficulty level (or lack thereof!). It was so easy and would be great for anyone who’s busy or who doesn’t have a lot of experience cooking. The honeynut squash are so cute! Plus you don’t have to peel them and they’re really easy to cut. The taste was a lot like acorn squash or butternut. The fish portions were adequate for the recommended 2 servings, but we did have leftover squash and couscous, which I was able to repurpose into dinner the next night with chickpeas, sundried tomatoes, and extra spinach. Win-win! Lastly (I’m starting to sound like a broken record here…) I’d add more vegetables if I made it in the future. Extra spinach in the couscous felt necessary to balance it out. Overall consensus— this was a winner. I'd make this recipe again, but would add more vegetables. And I've already gone out to find honeynut squash! The biggest perk was the convenience. 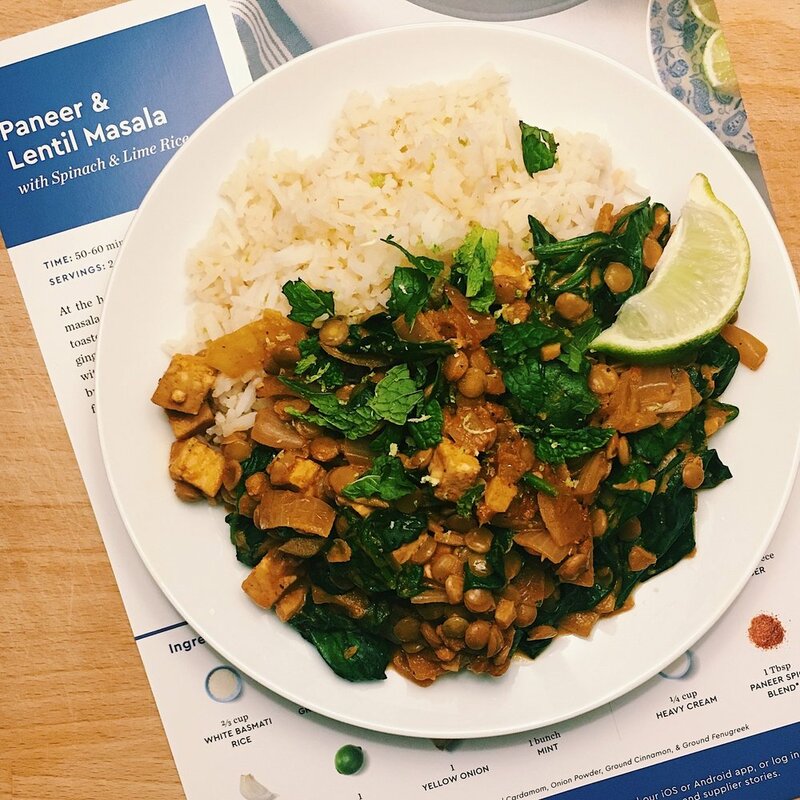 I didn’t feel that these meals were much healthier than getting take out, but they can definitely be veggied up a little if you have extra vegetables in your fridge. I’d recommend checking the ingredients list and the nutrition information before ordering so that you can make an educated decision. I did enjoy the taste of all of them, which is obviously very important! Not sure if I’d order again, but I am interested in trying some of the other meal delivery kits to see how they’d compare. They could be great for weeks when you’re coming back from traveling or have a lot going on and don’t have time to grocery shop.